Limited research has examined smoking amongst recent cancer survivors or the relative contribution of factors on smoking behaviour. 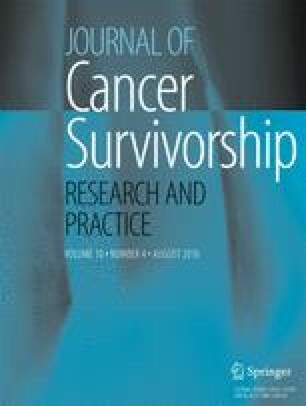 This study aimed to describe amongst recent Australian cancer survivors (i) prevalence of smoking by cancer type, (ii) characteristics associated with continued smoking following diagnosis, (iii) intention to quit among those who continue to smoke and (iv) characteristics associated with quitting following diagnosis. Cross-sectional data were analysed from 1299 cancer survivors diagnosed with their first primary cancer recruited from two Australian cancer registries in Australia between 2006 and 2008. Of participants, 8.6 % reported current smoking. Participants who were younger and single or widowed reported higher odds of current smoking. Participants who had a certificate/diploma or tertiary education reported lower odds of smoking. Among current smokers, 53 % intended to quit in the future. Lung cancer survivors reported more than four times the odds of quitting smoking since diagnosis compared to other cancer types. Of recent Australian cancer survivors, 14 % report continued smoking. Smoking following a cancer diagnosis is associated with increased risk of mortality and further morbidity. There is a need to target cessation efforts towards survivors who are younger, without a partner and with a low level of education. An erratum to this article can be found at http://dx.doi.org/10.1007/s11764-016-0561-4. The research on which this paper is based was conducted as part of the Cancer Survival Study. Funding for this study was provided by the National Health & Medical Research Council (ID 252418), Cancer Council NSW, Hunter Medical Research Institute, Honda Foundation and University of Newcastle. These funding bodies played no role in the study design, data collection, analysis or interpretation, in the writing of the report or in the decision to submit the article for publication. Dr. Bryant is supported by an Australian Research Council Post-Doctoral Industry Fellowship. Dr. Boyes is supported by a National Health & Medical Research Council Early Career Fellowship (APP1073317) and Cancer Institute NSW Early Career Fellowship (13/ECF/1-37). Professor Girgis is supported by a Cancer Institute NSW grant. The Victorian Cancer Registry (Cancer Council Victoria) and NSW Central Cancer Registry (NSW Department of Health and Cancer Institute NSW) assisted with case recruitment. Our thanks to Alison Zucca for research support, Sandra Dowley for data management and Patrick McElduff for statistical assistance.